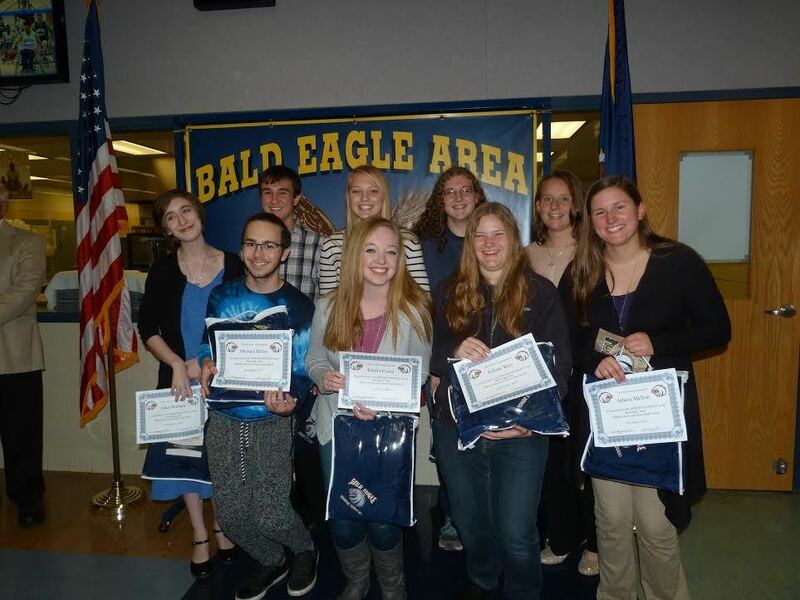 The Bald Eagle Area School District hosted its annual Scholastic Honors Banquet on Thursday night to celebrate students who are in the top 10 percent of their class. The event included a catered dinner served by district administrators and school board members, and guest speaker Curtis Markle -- a 1998 BEA graduate; and para athlete who competes nationally in throwing the javelin, shot put and discus. Markle, who has been paralyzed since 2004, spoke about overcoming adversity. Among those honored were 78 students from seventh to 12th grades. Grade 12: Michael Bailey, Austin Besong, Kaitlin Carter, Morgan Chambers, Faith Corman, Jared Gettig, Ireland Hackman, Mariah Houck, Mae Hugar, Heather Huyett, Adazia Mellott, Emma Murgas, Brooke Myers, Tiffany Rees, Alice Statham, Brooke Woodward. Grade 11: Taylor Bumgarner, Chelsea Butterworth, Tessa Cingle, Cameron Cody, Garrett Giedroc, Katherine Haagen, Rebecca Hoffman, Nicholas Ishler, Shane Lambert-Brooks, Courtney Metz, Natalie Nyman, Jakob Ream, Julia Thompson, Lauren Wellar. Grade 10: Asher Burkett, Caleb Cain, Lauren Fisher, Grace Hugar, Madisyn McAfee, Paige Murgas, Matthew Reese, Madison Rockey, Emily Shiels, Sierra Surovec, Peter Van Cise, Luke Wilson. Grade 9: Madison Eckley, Amayah Fogleman, Anastasia Frank, Zebulon Fry, Elyssa Greene, Sarah Holler, Meghan Ishler, Cole Parsons, Julia Patcyk, Lexi Skripek, Hannah Ternent, Rachel Veneziano, Grace Wagner. Grade 8: Claire Andrews, Miya Barton, Dylan Hartley, Jaci Masden, Kaleb Matis, Madison Perry, Emily Ream, Sadie Roberts, Marina Shawley, Autumn Tobias, Dakota Wilson, Max Yetsko. Grade 7: Charlotte Cingle, Quentin Conway, Zachary Gates, Alaina Grant, Alexandria Hacker, Ember Herr, Abigail Hoover, Nadya Kronin, Airren Lose, Katelyn Lucas, Caden McCullough.